In the previous chapters, we have been building up a case for a particular pattern of eating which is the ideal for the human beings. In this chapter we look at our eating patterns today and what is right and wrong about them. Here we look at the foods that have crept into the diet in the last 10,000 years and pass judgment on them. That is, judge whether they can be admitted to the ‘club’ and if not, if there is anything they can do to shape up. lettuce, tomatoes, cherries, apples, broccoli, grapefruit, mushroom. See Appendix 1, Table 5 for more. Carbohydrates span the whole spectrum of vegetation from lettuce, broccoli and apples through to bread, cakes, and sugar. Many carbohydrates either form a natural part of the human diet or are novelties that happen to conform to the same profile. These are termed ‘favorable’ carbohydrates. ripe banana, rice, oatmeal, dried fruits, macaroni. See Appendix 1,Table 4 for more. Others are marginal foods. Either they are novelties that don’t quite make the grade, or they are modern adaptations that have become marginal. These are termed ‘borderline’ carbohydrates. Finally, there is a category of ‘bad’ carbohydrates. These are foods that humans were never designed to consume. Typically they are sugars, cereals and other starches. Baked potato, most breakfast cereals, bread, cakes, waffles, cookies, etc. sugar, honey, maple syrup, corn syrup, malt, dextrose, etc. See Appendix 1, Table 3 for more. How are the categories decided upon? The worst characteristic that a carbohydrate can have is to be highly glycemic. This is its power to raise blood-sugar levels to dangerous levels. One of the most dangerous dietary errors committed today is the consumption of bad carbohydrates on a massive scale. The result is blood sugar levels out of control. Why does this happen? The human body chemistry is designed to work with a low octane fuel - plant food. It cannot cope with large quantities of ‘rocket fuel’ – notably simple sugars and bad starches. Simple sugars and bad starches are quickly converted to glucose, which rapidly enters the bloodstream. The bloodstream has to maintain blood glucose levels within close limits. This is done by the pancreas releasing the hormone insulin into the bloodstream. The quantities of insulin are dosed in accordance with the arrival of glucose. If the arrival of glucose is rapid, the pancreas cannot maintain this orderly matching of insulin to glucose. Initially, the pancreas does not react fast enough and there is an overdose of glucose in the blood­stream. This condition is known as hyperglycemia. An excess of glucose in the blood kills nerve endings and damages blood vessels. Kidney disease, blindness and amputations are the consequence of chronic hyper­glycemia. Then the pancreas catches up and overcompensates. A sudden excess peak of glucose in the bloodstream is mopped up by a flash flood of insulin which is in excess of that needed. There is now a deficiency of glucose in the blood. This condition is known as hypoglycemia. It is characterized by feelings of drowsiness, dizziness, irritability, exhaustion, cold sweats, depression, headaches etc. These feelings are accompanied by a desperate craving for something sugary. Diabetes is a common result of bad carbohydrate abuse. The pancreas fails, or the fat cells become insensitive. But worse, this switchback of blood sugar levels results in a cascade of debilitating diseases: diabetes, heart disease, blocked arteries, kidney disease, obesity and various immune system disorders such as cancer, arthritis and allergies. How does this come about? High blood sugar levels mean high insulin levels. This is a biochemical disaster. Insulin is a powerful hormone. One of its functions is to cause the cells to sweep up excess glucose out of the blood and so bring the glucose concentration back to normal. But at the same time it is also sweeping fat into the fat cells. The story gets worse. Insulin floating around in abnormal quantities (known as ‘hyperinsulinemia’) upsets all other kinds of hormonal reactions. Remember those diagrams in Chapter Four? Most people who have high cholesterol levels have it because their body is making it. The insulin effectively instructs the liver to make more than necessary. Similar mechanisms increase blood clotting, damage arteries, suppress the immune system (allowing cancers to grow), even cause the bones to lose calcium! The problem with hyperinsulinemia is that you don’t even feel it! You cannot feel if your insulin levels are out of control. Hyperinsulinemia goes about its work silently, you notice nothing until it is too late and you have the stroke, the heart attack, the cancer is expressed, your bones are like Swiss cheese, your arteries are sludged up. Think of the phenomenon like the iceberg that sank the Titanic. You see very little on the surface, but underneath lurks mortal danger. You just see some disconnected peaks, but under the surface they are all linked. So how do we avoid ‘abnormal’ blood sugar levels? Very simply by not consuming foodstuffs which contain bad carbohydrates. You can start today and you will start to feel the benefits straight away. If you are already hyperglycemic then be prepared. At several places throughout the book, food is talked about as a kind of drug. This is where the truth of that statement will be borne in on you. Just like any junky going cold turkey you will get withdrawal symptoms such as cold sweats, headaches, and a craving for the drug that you are trying to abandon, sugar in all its forms. How do we know what bad carbohydrates are? A new tool has been developed recently which gives guidance. It is known as the Glycemic Index. It has to be understood that the measurement of glycemic index is not a terribly precise science. According to the variability of the food and the variability of the feeder, the glycemic index can vary. However it is precise enough to tell us all that we need to know. It tells us enough to confirm or deny our worst fears, and help us to choose wisely. Broadly, carbohydrates are classified by glycemic index as shown in this table. The divisions between the categories are necessarily arbitrary, but it is a good rule of thumb. How are we to know the glycemic index, unless we are told it? The answer is, we don’t. The only way to know the G.I. for a particular food is to feed it to volunteers under controlled conditions and then measure their blood sugar level at half-hour intervals. When this was first done in the early 1980’s it revolutionized the way carbohydrates were viewed. The researchers were astonished to find that the ‘common sense’ medical advice to prefer ‘complex carbohydrates’ was misguided. It turned out that whole-wheat bread was no better than white bread, which in turn was no better than sugar itself. Or, that the cornflake itself was just as bad as the honey coating. The only ‘safe’ foods (surprise, surprise) were the ‘very complex carbohydrates2’ such as green and yellow leafy vegetables and low sucrose fruits. In other words, human beings have a biochemistry perfectly adapted to this kind of carbohydrate. That is how our bodies are made, and that is the kind of fuel to give them. Human beings’ biochemistry is over-stressed by sugars, starchy carbohydrates (as found in cereals and grains) and some tubers (like potatoes). These are substances that have intruded into the human diet very recently. They have major drawbacks and we have no business consuming them. Since the time of the first researches, hundreds of carbohydrates have been studied and their glycemic indexes evaluated. A short selection is given in Appendix 1, Tables 3-5. A full list is published in the Natural Eating Manual. If the food you want is not in any of the tables? You can make a reasonable assessment by finding analogies with similar foods. But the real question is, what are you doing eating a food about which you have doubts anyway? If the food has an ingredient label, that very fact means that it is processed and is a confection of many additives and ingredients. Its effect on the body biochemistry is unknowable and therefore such a food is suspect. Food labels need to get a lot more sophisticated before the consumer will have all the information to make wise choices. In Europe for example, there is a brand of very dark, low sugar chocolate that mentions its glycemic index on the packet. It has a low G.I. of just 22. What do you know-- a safe confectionery item! A move to labeling like this would be a tremendous help, not only to consumers, but also in creating a more frank mentality amongst manufacturers about their products. That is a tour around the concept of glycemic index (G.I.). Refer to the tables in Appendix 1 regularly until their contents are completely familiar to you. Try to get a feel for which kind of foodstuff falls into which category. That way, you will negotiate your way with confidence through the minefield of dubious products offered for consumption today. Take your reading glasses when you go shopping and READ THE SMALL PRINT! Make a conscious effort to ditch the bad carbohydrates. Make a conscious effort to concentrate your meals on the favorable carbohydrates. Be cautious with the borderline carbohydrates. Paying serious attention to this question is one of the most important steps in re-structuring your eating habits. The question of G.I. has been treated at some length in this section on carbohydrates. It just remains to mention one other criterion for classifying carbohydrates. The carbohydrates that humans are designed to eat are high micro-nutrient density and high in soluble fibers. Classically, they are represented by fruit, vegetation (salads and vegetables), tubers, nuts and berries. Many other carbohydrates are micro-nutrient poor (such as sugars and cereals) and even protein poor (such as yams, cassava and Indian corn). It so happens that, with very few exceptions, they are also the foodstuffs that are highly glycemic. A Composite table of ‘Good Foods To Eat In Bulk’ is presented in Appendix 1 Table 1, and of ‘Good Foods to be Eaten in Controlled Quantities ’ in Appendix 1, Table 2. Eat unrestricted Favorable carbohydrates COPIOUSLY. The Human race is adapted to get its proteins as much from vegetation as animal matter. One of the greatest errors committed today is the over-consumption of protein in general and of animal protein in particular. It is estimated that on average Americans consume double the recommended daily amount of protein from all sources. This leads to negative calcium balance and osteoporosis, kidney disease, detoxification overload, acidosis and various digestive disorders. Many people have doubts about consuming animal flesh. As set out in the introduction, we leave such ethical con­sider­ations to the judgment of the individual reader. The modest quantities of meat consumed by the Human race in its evolutionary history were quite different in nature from what is available today. The problem with ‘farm’ meat is that it has been bred over millennia for high fat content. As bad luck would have it, the fat is highly saturated and it doesn’t even have the saving grace of containing essential fatty acids (vitamin F). Wild game meat has a much lower fat content (4%) and contains a good percentage of EFA’s. Yet this form of meat is inaccessible to the vast majority of the Western population. A good compromise is skinless chicken and turkey breast. They are only 4% fat, albeit not the best fatty acid profile. There is more leeway than we are led to believe in the body’s need for protein. For example, it has remarkable powers to compensate for low protein intake by resorbing and recycling waste proteins in the gut. Curiously, the total amount of protein consumed is less important than the amount of starch consumed with it. A high starch/protein ratio is more likely to lead to protein deficiency than lack of protein itself. The only peoples in the world who suffer protein deficiency are those whose staple diet is based on high starch/protein ratio, protein-impoverished starches such as cassava and Indian corn. Only worry about protein deficiency if you base your diet on empty calories (e.g. popcorn, hominy, sugar and alcohol). Our consumption of protein needs to fall between quite close limits – neither too little, nor too much. How do you manage this? You know the answer. Get your eating pattern right and the quantities work out just right. The Human race is designed for a very low fat diet. The only fats that the body needs are the essential fatty acids, linoleic and alpha linolenic acid. (vitamins F1 & F2) They are polyunsaturated fats and they need to be consumed in the ratio of between 4 and 1:1. This is how they occur in nature, present in about every form of vegetation.. It is unrealistic to think that in today’s world oils and fats are not going to be used. The defensive strategy is to keep them to a minimum and to ensure that they have the right nutritive profile. There are two great disasters that have overtaken the Western consumer in the last fifty years. The first is well known: the increase in consumption of saturated fat. This comes from two main sources, increased consumption of farm meat, and increased consumption of dairy products. Both of these are intruders in the human diet and carry with them a strong potential for undermining health. The problem with saturated fat is its potential to drive a coach and horses through the essential fatty acid hormonal cascade. (Remember the diagram in Chapter Four?). Saturated fat also depresses the immune system and other vital metabolic processes. The second disaster s less well known. It is the dramatic increase in the consumption of vegetable oils, notably the so-called ‘Omega 6’ oils. These are oils like sunflower oil, corn oil, peanut oil and safflower oil. Virtually unknown until World War II they now take a major share of the increased fat consumption. What is the problem with Omega 6 oils? They are too cheap and easily available! Hence the over-consumption. More seriously, these vegetable oils totally monopolize the Fatty Acid Hormonal Cascade (diagram in Chapter Four). They crowd out the alpha-linolenic acid pathway and lead to the over-production of certain hormones, which then harm health. If you imagine the competing pathways as being on opposite sides of a see-saw, then the overweight Omega 6 playground bully holds his end down leaving the Omega 3 lightweight helplessly kicking his legs in the air. This in turn leads to the over production of ‘bad’ hormones. These are responsible for the roll call of bad effects listed in the box. Truly, humans have no business consuming bulk vegetable oils! There is only one bulk oil which really complies with the ideal profile: canola oil, also known as colza oil or rapeseed oil. It is also possible to find ‘spreads’ made from it. Other oils which are fine are walnut oil and flaxseed (linseed) oil. Hempseed oil too, has an excellent profile. Olive oil’s main quality is that it is not Omega 6 or saturated. Its influence on the body’s metabolism is neutral. All solid fats are suspect. Their solid nature betrays the presence of large quantities of saturated fats. Also avoid trans-fatty acid and hydrogenated fats. They are just as bad as saturated fats. These all have the effect of sabotaging the Hormonal Cascade altogether. If you eat too much saturated, hydrogenated and transfatty acids, it doesn’t matter how much of the essential fatty acids you consume, their metabolisation will be blocked, and you will suffer vitamin F (EFA) deficiency! Saturated fats provoke vitamin F deficiency. We have talked a great deal about essential fatty acids (vitamins F1 and F2). They are part of the polyunsaturated fatty acid series. All you need to hold onto is that all other fatty acids are just empty calories at best and quite harmful at worst. Non-essential fatty acids are just empty calories at best, dangerous at worst. What are the non-essential fatty acids? We have all heard of the bogeymen – saturated fats. It is less commonly known that they form a series. The main ones present in food are lauric acid, stearic acid, myristic acid and palmitic acid. In reality, they have different degrees of ‘badness’. And then, of course, there are the ‘goody’ monounsaturated fatty acids like oleic acid as found in olive oil. Having read this far, you will appreciate that their ‘goodness’ resides mostly in the fact that they do no harm – they are still chiefly empty calories. Just know that it is possible to steer your way through the minefield of modern foodstuffs guided by the curiosities of fatty acid chemistry. There is not space in this book to go into all the subtleties (for this refer to the Natural Eating Manual). Here is an overview to give you a taste of the possibilities. Fatty acids are present in our food and in our bloodstream mostly as triglycerides. A triglyceride is a molecule of glycerol to which three fatty acids are attached – in positions 1, 2 and 3. Now comes a clever part. When we eat a triglyceride, it is split down into its component parts in the digestive tract and then it gets reconstructed as a different triglyceride in the bloodstream. Now comes a second clever part. Depending on the fatty acid’s position (1, 2 or 3) on the molecule, so it is more or less bio-available. Thus, in reality cocoa butter is much less cholesterolemic than in theory because its saturated fatty acids are in positions 1 and 3. The digestive system is less efficient at deconstructing fatty acids in these positions and as a result they are less likely to be absorbed into the body. This effect is accent uated when calcium salts are formed. This appears to be the explanation for the relatively harmless effect of cheese fats. All this might seem complicated – and it is! Indeed, it is so complicated that the full picture is still being worked out. Once again, you do not have to try to micromanage these processes. But you should understand that this is why it is possible to admit some, on the face of it unpromising, fatty foodstuffs (like avocado and cocoa butter) into the Natural Eating Pattern. It is also why others, like coconut (the meat, oil, milk and butter) should be used with caution. · Eat as little oil and fat as possible. · What you do eat should be rich in both essential fatty acids. · The best oils are canola (best, and good for most uses). walnut oil, hempseed oil and flaxseed oil (e.g. use them as a condiment). · You can also include an ‘oily’ fish a few times a week (optional). · Banish ‘bad’ fats and oils. Note that olive oil is neither good nor bad, and it is still empty calories. Milk is strictly for unweaned babies. Only babies are supplied with the enzymes (rennet, lactase etc.) for the proper digestion and treatment of milk. Adults who drink milk run the risk of protein over-consumption and osteoporosis, indigestion and flatulence, allergies, and clogged arteries from the saturated fat. Cheese, although an artifact of man’s ingenuity, is probably tolerable in small quantities. Its saturated fat would appear to be poorly absorbed, and the lactose problem has been more or less eliminated in the manufacturing process. However the cholesterol-raising casein (a protein) content is a concern. Yogurt again is a man-made artifact. The low fat variety is probably tolerable in small quantities. The protein content is still the cholesterol raising sort, but the lactose problem has been overcome in the fermentation process. · Milk is definitely unsafe. · Butter is definitely harmful. · Cream is definitely harmful. · Low fat yogurt is tolerated in frugal quantities. · Cheese is tolerated in frugal quantities. 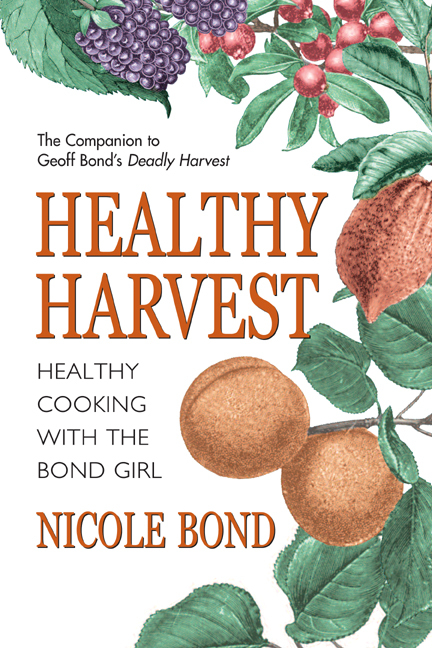 In Chapter Four we had a look at all the ‘novelty’ foods that came into the human diet since the farming revolution 10,000 years ago. In this chapter we have so far frightened ourselves by examining the harm that many of them do to our health. Now let’s give ourselves some encouragement. Let us grant a passport into our kitchen to favorable ‘novelty’ foods. Here is a selection of the most common together with their pros and cons. The tomato belongs to the nightshade family of plants and is closely related to bell-peppers, potato, tobacco and deadly nightshade (belladonna). Most nightshades, including the potato, but excluding the tomato, contain poisonous alkaloids. The alkaloids are destroyed on cooking. The tomato was brought to Europe in the 16th Century. by the Spanish conquistadors who found it with the Incas in Peru . It took another three centuries before it was bred into its modern forms and accepted into the food supply. Since the 19th Century, the tomato has become an integral part of many cuisines. Tomatoes are packed with valuable health helpful micronutrients. Tomatoes are flavorful, cheap and readily available. Tomatoes, even in processed form (canned, paste, ketchup) still retain much of their nutritional value. Tomatoes can be eaten either as a fruit or a vegetable. Tomatoes are strongly acidic and, in susceptible people, can give digestive difficulties either on their own or in combination with other foods , particularly starches. Tea is a native of the area bounded by Tibet , Northern India and China . It was first cultivated and drunk as a beverage some 5,000 years ago. Both green tea and black tea come from the same type of plant, just the drying and fermenting are slightly different. Tea contains powerful anti-oxidants and other micronutrients which are helpful to health. Tea is cheap, flavorful and freely available. Tea, due to its mild caffeine content, has an agreeably stimulating property. Tea contains ‘anti-nutrients’ such as tannins, that can inactivate micronutrients ingested at the same time. Coffee originated in Ethiopia and has been used by the Arabic cultures for many centuries. It only appeared in the West during the 17th Century. Coffee is flavorful and readily available. Modest consumption of weak (American) coffee has no adverse effects. Coffee, due to its caffeine content, has agreeable stimulating properties. Coffee contains micronutrients that are helpful to health. Pots were fabricated for the first time about 8,000 years ago in the Near East . Within a few years wine had been invented! In ancient times wine was much drunk, but diluted with water – it seems that otherwise the taste wasn’t too great. Wine today is a flavorful and agreeable beverage. Wine in moderation, through its modest alcohol content, has a pleasant relaxing effect. Wine contains anti-oxidants and other micronutrients that are health helpful. Wine in excess is health harmful. Chicken was first domesticated about 6,000 years ago in south east Asia. Turkey is much more recent – it dates from 16th Century North America . The skinless breast of chicken and turkey is a low fat meat comparable to the composition of the wild game of our Pleistocene ancestors. The fat is of borderline profile. Olive oil has been cultivated for several thousand years. It certainly dates from biblical times. Olive oil is a tasty, readily available oil. Olive oil is harmless to human bio-chemistry. Olive oil is empty calories. Canadian enterprises recently improved on varieties of rapeseed (colza) by removing a harmful compound, erucic acid to produce Canola oil (whence the name). Canola oil has an almost perfect essential fatty acid profile. Canola oil is cheap and freely available. Even canola oil in excess of a couple of teaspoons a day is just empty calories. Our Pleistocene ancestors had occasional access to freshwater fish, but it is doubtful that they formed a significant part of the diet. Oily fish are typically cold, sea water fish. These fish only entered the diet in a big way since the development of ocean going fishing industries in the last century, and salmon farming in this century. Oily fish are flavorful and readily available. Oily fish contain very helpful oils, notably eicosapentaenoic acid, a surrogate for the much sought-after alpha linolenic acid (vitamin F2). Cocoa originated in central America and only entered the diet in a big way in the last century. Cocoa makes highly appreciated confectionery. Cocoa in its pure form is quite harmless. Cocoa is packed with high-quality polyphenol antioxidants. Cocoa is often combined with sugar and milk in ways that make unsuitable chocolate. The over-consumption of acid-forming foods is another major dietary error today. Note that we are not talking here about foods that taste acid. We mean ‘acid-forming’ foods. These are ones that only after digestion, absorption and metabolisation by the body, have the result of acidifying the body. The prod­ucts of digestion are rarely neutral. All foods will cause the blood to be either more acidic or alkaline. The body is constantly juggling to restore a neutral balance. The average westerner is in chronic acid surplus. The body restores the bal­ance by using an alkali to neutralize the acidity. What is this alkali? None other than one based on calcium! Consuming a relentlessly acid diet causes the body to draw down its re­serves of calcium. What are acid forming foods? They are ones that contain sulfur, phosphorus and chlorine. These elements are found chiefly in proteins like meat, fish, eggs and cheese and starches like bread, flour and cereals. For example, bland roast chicken is one of the most acidifying foods around. What are alkali forming foods? Ones that have a predominance of metallic elements like potassium, sodium, iron and calcium. None other than fruit, salads and vegetables! Once again, the problem is not necessarily foods that taste acid. Many fruits taste acid, but by a curious bio-chemical pathway, their resultant on the body is alkaline. For example grapefruit (q.v.) although acid to the taste has a strong alkalizing effect. Why do some acid tasting foods not acidify the body? The answer lies in what happens to the products of digestion. The acid taste of many fruits is due to the presence of organic acids such as malic acid. This acid stays intact through the mouth, through the stomach and into the intestine. At all points up to here, the effect on the digestive process and lining is acidic. In the intestine the malic acid passes through the intestinal wall into the blood stream. Here the malic acid is broken down into smaller molecules, the net result of which is that the acid component is exhaled through the lungs. The acid fraction of the fruit is thus excreted, leaving the alkalizing fraction behind in the body. The Natural Eat­ing Pattern, not surprisingly, correctly predicts the importance of this acid/alkali balance for human beings It ensures that the ratio of acid-forming to alkali-forming foods is a healthy one of at least 75% alkali forming by weight. Consuming a relentlessly acid diet causes the body to draw down its re­serves of calcium. The body is endowed with a remarkable sewage treatment plant, the liver. Blood vessels carry the products of digestion to the liver. There, the liver removes most noxious substances. Where it can, it transforms them step by step into innocuous substances and shoots them out, with the bile, back into the beginning of the intestinal tract. Everything is fine so long as the liver can cope with the toxic load. However all is not well with the way we eat today. Passage through the intestines is slow and consists of foods which give rise to a high level of toxic matter. In addition, this environment encourages the growth of unfriendly bacteria and fungi, which produce their own toxins. Other foods, like hot peppers, cause the lining of the intestine to be more porous, known as ‘leaky gut syndrome’. It doesn’t take much. The gut wall is as thin as tissue paper. That is all that separates the gunge in your gut from the your nice clean blood circulation! Even under good conditions, after a meal there are always some bacteria that pass through into the blood. For example, primitive herders (and for that matter wild west ranchers) knew to starve a beast for 24 hours before slaughter. That way there are fewer bacteria generalized throughout the carcass and the meat keeps longer. Today, our dietary errors vastly increase both the porosity of the gut and the micro-organism load. So it is that abnormal quantities of digestion toxins, bacterial and fungal toxins, and the bacteria and fungi themselves, pass into the blood-stream. The liver cannot cope and the bacteria, fungi and toxins continue on their way to other parts of the body where they cause mischief. They can be at the origin of various allergies, auto-immune response, or the simple poisoning of various bodily functions. All kinds of disorders can arise: headaches, arthritis, tiredness, irritability and depression. Ever wondered why sometimes the contents of your bowels smell like estuary sludge? Do you ever worry about it? Well, you should! Recent research shows that this is due to the abnormal presence of sulfur-reducing bacteria. Why do they flourish? Because they feed on the sulfur-bearing amino acids in meat (sulfur again). Does it matter? Recent research has shown a link with ulcerative colitis, a serious inflammatory bowel disease. Worse, the toxic sulfides released by these bacteria promote cancerous changes in gut cells by damaging their DNA . All this helps to explain why heavy meat eaters are more vulnerable to colon cancer. So what about vegetarians? They seem to be protected because plant proteins usually do not contain sulfur, and the protein comes in a carbohydrate package. Finally, there is another factor, sulfur used as a preservative. Sulfur in many forms, but collectively baptized ‘sulfur dioxide’, is ubiquitous in the processed food industry. It is present in everything from packaged salads to jams, hamburgers, sausages, instant soup, salad bars, beer and wine. People who eat a lot of processed foods not only promote sulfur bacteria in their gut, they also raise their sensitivity to allergic reactions – and that’s probably all part of the same syndrome. It is important too, that passage of food through the digestive tract be prompt. What speeds up intestinal transit? Eating plenty of vegetable fiber! Not only do the indigestible remains provide greater volume, more importantly, the friendly bacteria get a rich nutritive diet too. Friendly bacteria are methanogens. They are the ones that produce methane in the gut. They thrive, multiply fast, and greatly increase the bulk of the faeces. Eating naturally ensures that the sewer pipes are kept well flushed out! Eating naturally de-toxifies and repairs the body’s sewage treatment plant. The Need for Separating What We Eat. Remarkably, our digestive system can perform these feats - but not simultaneously. A chemical engineer would say that each feedstock has to be treated on its own as a batch. For example, a mixed hamper of washing might comprise greasy overalls and silk underwear. One knows to treat this load in batches because the processes required are conflicting. We know that the washing machine can satisfy all these requirements on condition that each type of wash is dealt with separately. The foregoing consideration leads to the concept of eating food in batches, which require the same chemical and mechanical treatment in the digestive tract. It is known as the principle of proper food combining. Today, we have complicated and confounded the process by introducing new types of food into the diet. Notably starches, dairy products and fruits with a grossly distorted sugar profile. Foodstuffs can be classified, as can laundry, into the categories which have to be considered independently. The latest understanding of the biological processes gives the following important results. · Fruits should not be eaten in combination with any of the other categories, particularly protein. Fruits should be eaten on an empty stomach. 1st Reason: Fruits are digested in the small intestine, and shouldn’t get held up waiting in the stomach. If this happens, they will start to ferment, interfere with other digestive processes, and have their nutritive value compromised. 2nd Reason: fruits have a predominantly acid nature. Acid inhibits ptyalin production in the mouth, thus conflicting with starch requirements and inhibits gastric acid production in the stomach, thus conflicting with protein requirement. Fruits are best eaten on their own. · Protein/Starch combinations should be avoided. 1st Reason: the human digestive system is designed for the through-put of a high volume of low density, easily digestible foodstuff, chiefly plant food. i.e. fruit and vegetables. Starches present a problem since their digestion starts in the mouth (with ptyalin). This digestion is stopped by the acid in the stomach, and then continued in the small intestine, under the action of enzymes like amylase secreted down the pancreatic duct by the pancreas. Proteins, and particularly animal proteins, present another problem They undergo a prolonged churning and exposure to the acids and enzymes present in the stomach. It can be several hours before the stomach releases the resulting chyme into the small intestine. The digestion then continues in the small intestine under the action of enzymes like protease, again secreted down the pancreatic duct by the pancreas. Unlike the chicken, which has three pancreatic ducts, the single human pancreatic duct is a bottleneck. A choice has to be made by the pancreas as to which enzyme to secrete first. If the starch/protein combination contained predominantly starch (90%), or predominantly protein (90%) , then the choice is easy, and digestion can proceed as nature intended. If the meal is an equal mix of starch and protein, then enzyme secretion by the pancreas is perturbed. The imperfectly digested remains travel with difficulty through the digestive tract. The highly sophisticated machinery of enzyme activity, hormonal feedback and nutrient absorption is perturbed. The balance of the intestinal flora is disturbed. Bad bacteria multiply. Helpful bacteria are discouraged. The intestinal wall can become porous and, as described earlier, bacteria, funguses (such as candida) and undigested food particles travel through the bloodstream, creating mischief wherever they go. Dyspepsia, ulcerated colitis, liver disorders, demineralization, depression of the immune system, candidiasis, allergies, and general bad health can be the result. The digestive system is designed to work chiefly on fruit and vegetation. Meat is more problematic. Starch is even more so. It simply is not a good idea to give it more than one problematic foodstuff at a time to digest. Here the problem is compounded by the two nutrients having conflicting treatment processes. Starch/Protein combinations perturb digestive processes. 2nd Reason: proteins, like starch, also provoke the secretion of insulin. When starches are ingested at the same time, insulin secretion is multiplied. All the bad effects of hyperinsulinemia are therefore multiplied. Starch/Protein combinations increase hyperinsulinemia and therefore increase the risk of heart disease, atherosclerosis, obesity, and cancer. Worse, almost always fat is present in large proportions with protein. This fat gets stored immediately and preferentially into the fat cells. Starch/Protein combinations multiply the fattening effect of fat. Starch/Protein combinations multiply the fattening effect. Finally, let’s keep things in perspective. There are many times when small amounts of protein are included in a starch dish. Such is the case with traditional Asian cooking where there are little bits of chicken, nuts or fish in the rice. Conversely there are occasions when there are small amounts of starch in a protein dish, like a few bits of sweetcorn in a tuna salad. This is unimportant provided either the starch or the protein dominates. The trouble arises when the proteins and starches are equally balanced and they fight each other for priority. This is the case with so much of what we eat today. For example, bacon and eggs with French fries, hot dogs, hamburgers or cheese sandwich. Starch/Protein combinations cause trouble when they are present in nearly equal proportions and they fight each other for dominance. · Salads and Vegetables do not require any special combining measures. · Oils and Fats do not require any special combining measures. The human body anatomy is designed to work with frequent but small quantities of food. 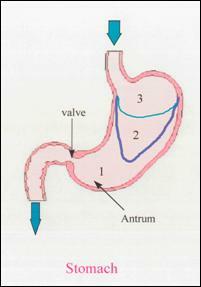 The functioning of the stomach, as it receives food and processes it, has been closely studied. One thing is clear. The stomach does not operate as a kind of simmering witches cauldron, where all that is ingested at a meal is all churned up together. What actually happens is that the first mouthfuls slide down the stomach wall and settle at the far end, the antrum. They fill up the space shown in area 1 of the diagram. Here, muscular churning takes place to thoroughly mix the food with the gastric juices. The next batch also slides down the stomach wall, partly stays clinging to it, and settles on top of the first batch. This batch too gets good exposure to the gastric juices secreted by the stomach wall. As the first batch is evacuated toward the duodenum, the second is propelled by peristaltic action to take its place in the antrum and to be churned in its turn. If you stop eating at this point, then digestion has proceeded as it is designed to do. However, for most of us that is not the end of the matter. We are by now only on to the main course. Maybe it is steak and French fries. These slide down into the stomach. Remember that the first and second batches have coated the stomach walls. This third batch settles in the middle (area 2 of the diagram). It is not in contact with the gastric juices. This is the opportunity for the animal meat to putrefy and the potato to ferment. Many people than add insult to injury by eating fresh fruit desert. This sits on top of everything else you have eaten (area 3 in the diagram). The fruit quietly ferments provoking yet more gas and indigestion. Here are major reasons why large meals are at the origin of bad digestion and bad health. Large meals compromise good digestion and undermine health. It is estimated that the ideal volume of a meal is no more than one and a half pints. This is the volume which just fills the stomach without stretching it. Increase the quantity to two pints and the stomach has to stretch but within acceptable limits. Most of us in the opulent West have been so used to overfilling our stomachs that they have become permanently stretched and out of shape. The lesson is that we should eat little but often. and always within the principles of Natural Eating! The pancreas is a multifunction organ that secretes a wide variety of hormones and digestive enzymes under instruction from other parts of the body. Carbohydrates had originally been classified into ‘simple’ and ‘complex’. The simple carbohydrates are sugars whose molecules are simple in structure and were consequently thought to be rapidly absorbed. The complex carbohydrates are chiefly starches whose molecule is complicated and were consequently thought to take longer to absorb. This assumption ignored the remarkable power of digestive enzymes to speed up chemical processes thousands of times. In reality, bread hits the bloodstream as soon as sugar does. A new category of carbohydrates has been gaining currency, the ‘very complex carbohydrates’. These are the colored plant foods rich in various oligosaccharides that are both complex and slower to digest. Cassava, also called manioc, is an edible tuber from the American tropics probably first cultivated by the Maya. Its flour, bread and tapioca are widely consumed throughout the tropics. People who rely too much on it develop the deficiency disease kwashiorkor. In nature oils never occur on their own, they always come associated with proteins (as in fish and nuts) carbohydrates (as in corn and sunflower) or both. It is most unnatural for oils to be available in bulk and our bodies are not designed to cope with that. Tomatoes are acid to the taste and to the digestive system but, once metabolized, have an alkalizing effect on body fluids. See the segment later in this chapter, The Acid/Alkali Balance in the Body. This is broiler chicken. Free browsing chicken will have a better fatty acid profile. Alkali forming foods, for the most part plant foods, have a high percentage of water. Most acid forming foods, the protein-rich ones, are dense. To strike the balance, the ratio of alkali forming to acid forming has to be at least 3 to 1, or 75% of the total, by weight.